Tear the bread into small pieces, or process into coarse crumbs. 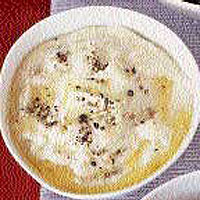 Put the milk in a pan with the onion (studded with the cloves), the bay leaf and a twist of pepper. Bring to the boil, take off the heat, cover and leave to infuse for at least 1 hour. Shortly before serving, fish out the onion and bay leaf, add the bread, and stir over a gentle heat until simmering gently. Simmer for 2-3 minutes. Turn off the heat and stir in the butter. Season and serve hot.